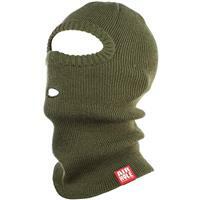 The professional's favourite and perfect for under a helmet, the balaclava is superior in warmth and functionality. The flexible face piece can be pulled down, allowing the wearer to eat lunch, cool down, or share a worthy story on the life without removing the mask. The picture was pretty misleading, it's not thick around the eyes like it is in the picture. Instead it's the same embroidering as there is around the mouth, and it's pretty thin in general. The eye hole is kind of small and to line the eyes and mouth up it fits a little funny (could be just my weird head). It has been pretty cold, so I didn't want to take the time to send it back and find something else (I use it mostly when i'm shoveling, but i wouldn't use this snowboarding), and i guess it does its job, but for what it is, I would recommend finding something cheaper. I was hoping this would be the best of both worlds between an airhole face mask, and a spacecraft facesock, both of which I've loved in the past, but that's just not what it is. First time with an Airhole mask, awesome idea. The front of your mask will no longer be soaked with your nasty, hot breath.